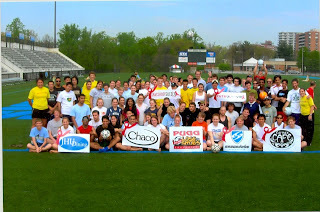 On April 26th, Johns Hopkins University hosted its first PUGG Lose the Shoes 3 v. 3 Barefoot Soccer Tournament in conjunction with the annual JHU Spring Fair. Thousands of people enjoyed the weekend full of great music, food, the famous beer garden, and this year … some awesome barefoot soccer. Over 125 people came out to play or watch — from soccer fanatics to public health advocates — and the group raised over $2000 for Grassroot Soccer and our very own Futbol para la Vida progam. Thanks so much to Johanna Chapin — a visiting futbolista with Las Chicas of Batey Libertad during her time at PUCMM — for organizing the event and raising funds and awareness for our HIV/AIDS prevention education program. Congratulations to Johanna and all the organizers and participants.